The recess appointment of Richard Cordray, director of the Consumer Financial Protection Bureau, is in trouble, which could threaten many of the bureau's biggest victories. Some $425 million of enforcement actions against credit card companies could be at risk as a result of last week's court ruling against the Obama administration. Last Friday, a U.S. Appeals Court said President Obama's recess appointments to the National Labor Relations Board in 2011 were unconstitutional. 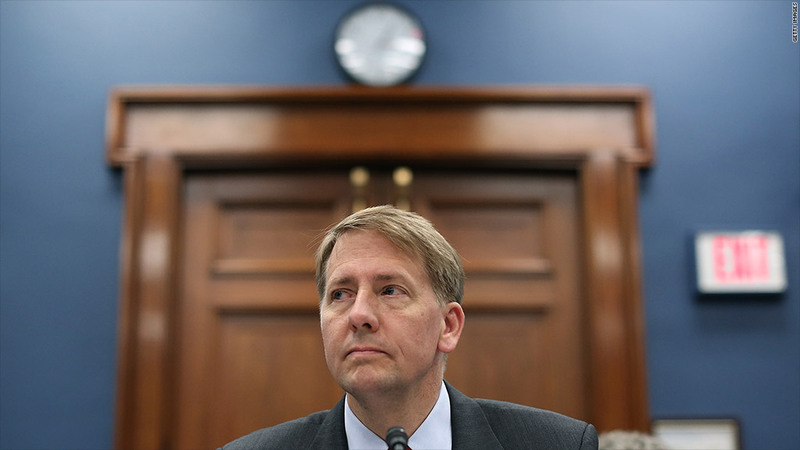 A recess appointment also gave the Consumer Financial Protection Bureau its director, Richard Cordray. The White House and the CFPB have both said Cordray's appointment remains intact. But most Washington experts are betting it's only a matter of time before Cordray's appointment is also struck down. That's a big deal, because some of the major powers that the bureau now wields, such as enforcing rules and regulating non-banking industries such as payday lenders, mortgage brokers and debt collectors, are drawn from having a director in place. The CFPB was created as a part of the Dodd-Frank banking reform law. "Mr. Cordray's appointment could be struck down as unconstitutional and invalid," said Brian Gardner, a Washington analyst for Keefe, Bruyette & Woods. "There is a good chance the CFPB's rules, which have been implemented by Director Cordray, would be struck down as invalid." Such a ruling could undo some of the bureau's biggest victories. They include three big enforcement actions against Capital One (COF), Discover (DFS) and American Express (AXP) for deceptive marketing and other charges that gave $425 million to consumers and another $66.5 million to the bureau as penalty fees. It could also freeze consumer bureau investigations and stop major rules the agency is currently working on, said former employees of the bureau. It could also call into question the bureau's recent new rules for mortgage lenders intended to reduce risky lending, Gardner said. Banks aren't happy about the growing possibility for regulatory chaos, several banking lobbyists said. "Chaos is never a positive for the banks, so we see this decision as an overall negative as it will raise questions about the validity of CFPB rules and enforcement action," said Jaret Seiberg, a Washington policy analyst for Guggenheim Partners. Scott Talbott, senior vice president of public policy at the Financial Services Roundtable, a lobbying group for big banks, said the group is preparing members for the "potential impact of any future rulings against Cordray's recess appointment." The bureau's fate could be decided in the next few weeks, because a small community bank, State National Bank of Big Spring, Texas, has already filed a lawsuit questioning whether Cordray's appointment was constitutional. The next deadline for that case is Feb. 13. Attempts to contact attorneys for the Texas bank were not successful. "Even if the Big Spring case is dismissed, it won't take long for a lot of other companies to raise the same constitutional challenges in their own CFPB matters," said Ronald Rubin, a partner at Hunton & Williams who worked in enforcement at the CFPB. "The bureau is on notice that Director Cordray's appointment is in jeopardy, and starting today that will be part of the discussion for almost everything the CFPB does."